a tragic Yuletide as her significant other and family's breadwinner, Mr. Myaga Iorwuese, was trapped and ruthlessly killed by suspected herders on his way to his farm. Portraying the deplorable episode in Gaambetiev Logo region, Mrs. Mngohol, said her late spouse went to the ranch on that critical day with a guarantee to return home and give cash to purchase things to observe Christmas the next day. She told The Nation that there was nothing to suggest that her husband was embarking on a journey of no return or that it would be the last time they would be seeing. The distraught widow, who wept as she fielded questions from the reporter, recalled that the entire village had come under heavy attacks from January 1 until August when the attacks abated and everyone returned to their farms. “Since August, the killings slowed down and we went into serious farming. So on the Christmas eve, my husband went to the farm with confidence that he would harvest and return on time to prepare for Christmas,” Mrs. Iorwuese said. She said she discovered that while she was preparing food for Christmas some of her family members, surrounded her, looking sorrowful. 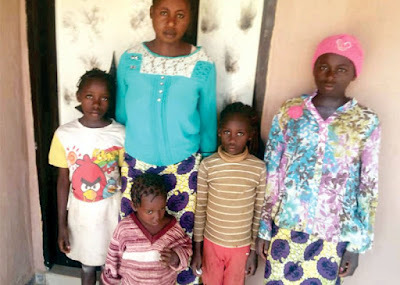 She became worried and asked them what had happened, and one of the family members told her that her husband had been shot dead in an ambush by suspected herdsmen. Mrs. Iorwuese said her husband was shot in the back and the bullets pierced through his stomach, killing him on the spot. She lamented that her husband was brutally killed, leaving six children for her to cater for. “All I want is justice. Let those who killed my husband be brought to justice so that his soul can rest in peace,” she said. Meanwhile most inhabitants of Chembe, Tombo ward and adjoining towns and villages have fled their homes following the return of herdsmen with their cattle. A community leader in Chembe town, Chief Anawah Joseph, said that herdsmen armed with sophisticated weapons have taken over almost all the settlements and destroying yet to be harvested crops. Chief Anawah, ex-media aide to Governor Gabriel Suswam, said if nothing is done by security the entire community faces imminent famine as all their crops were being destroyed by cattle. The spokesman of Benue State Police Command said the matter was yet to be reported to the police.